In a district similar to New York’s Harlem, Goutte d'Or in Barbès, Paris, North African immigrants, unwanted elsewhere, live. The Arabic and French communities, forced to live together, are intolerant of each other and confrontational. Salah, who comes from southern Magrheb, discovers the life of an immigrant in Paris and acts as witness to the incidents that weave the daily life of his countryment. This is painful for him to watch. French racist neighbors initiate assaults that escalate to a double murder. Salah, assisted by comrades, decides they must act and organizes a mass demonstration. The Arabic community gathers at the courthouse united and determined. 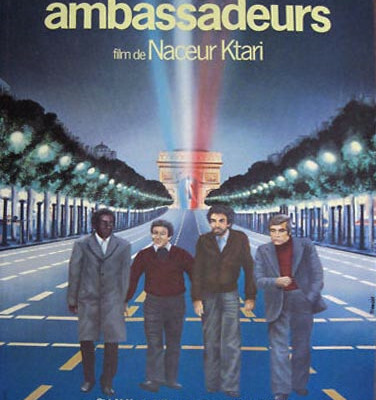 Gene Moskowitz, Les ambassadeurs, Variety (Newspaper archived online). Cinemas of the Maghreb by Roy Armes. Black Camera, Vol. 1, No. 1, The New Series (Winter 2009), pp. 5-29. A la recherche du cinéma de l’Afrique francophone by Jean Paulhan. The French Review Vol. 55, No. 6, Literature and Civilization of Black Francophone Africa (May, 1982), pp. 912-914.